I found Ed in La Paz, Baja, California, in 1969 where he had gone in 1966, after taking the M.A. from UCLA on the strength mainly of some really excellent visionary landscapes. Ed went to La Paz in order to do something more meaningful than having another show on La Cienega Blvd. With a grant from the Mexican government, he started, from an empty lot on a dirt road, a now self-sufficient Arts and Crafts center with enough kilns and looms to take dozens of destitute people off the street and give them hope and dignity, not to mention a livelihood. Ed literally gave back to people skills which were atavistic but long lost in that part of Mexico. When Ed returned to California to take a teaching job he left behind a thriving crafts workshop more like a community than a place to work. El Centro de Arte Regional was an arts and crafts school and workshop, located in La Paz, Baja California, Mexico, and dedicated to training underprivileged youngsters and to developing handicrafts in Baja California. The Center was founded in September, 1966, by Ed and Sheila Carrillo, a young California couple, graduates of U.C.L.A., with funds generously donated by Mr. James S. Copley, Chairman of the Corporation, The Copley Press, Inc. It has been constantly assisted and encouraged by the Redondo Beach Sister City Committee and the Territoral government of Baja California. locally. The clay and materials were mined and processed at the school. The students learned the entire process of ceramic-making– from mining and preparing the clay and building the equipment to the fine art of hand-painting. Instruction in dressmaking and design was set up for young girls. The Centre staff trained girls to sew and then employed them, paying each a salary and commissions on sales of their work. Designs by children were made into soft toys as well. As work in these fields became established, other crafts were tackled. As work in these fields became established, other crafts were tackled. Instruction was begun in hammock-making, and a weaving workshop was set up. Emphasis was on the production of completely handcrafted items, beautiful in design and high in quality. The Center grew from a handful of students working in an old warehouse to a group of over 20 young people studying and working in their remodeled workshops and displaying and selling their crafts in the new store adjoining the workrooms. Future plans included a new building to house silver and leather craft workshops so that the school could reach out and train many more young people, while at the same time, bringing new industry to Baja California. The school, a non-profit organization, operated entirely from the sales of its products. 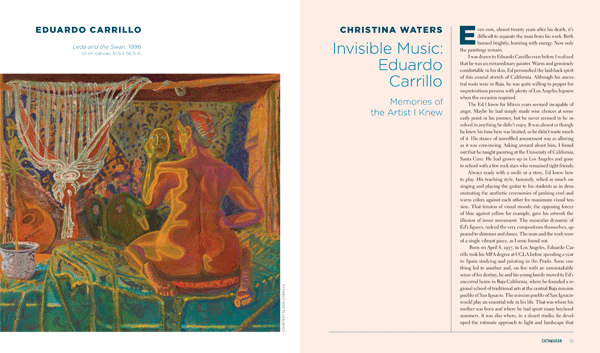 A catalog helped El Centro de Arte Regional grow, develop and continue its work training and providing jobs for the youth of Baja California Sur.